Only 5 years after China’s high-speed rail system launched, it is now transporting nearly twice as many passengers per month as China’s domestic air routes, The New York Times has reported. What’s more, passenger traffic on the trains is reported to have been growing 28% a year over the past several years. After a slow start in the first year of operation, the trains have reportedly become very popular. Nearly every seat is sold out, even though trains leave every few minutes for cities all over China. By next year, China’s high-speed rail network will be able to carry 54 million people a month; that’s about the same number of passengers traveling on U.S. domestic fights per month. The trains run at over 180 miles per hour, and usually on time. With the introduction of many new high-speed rail routes, journeys between cities that a few years ago used to take all day, now only take a couple of hours. 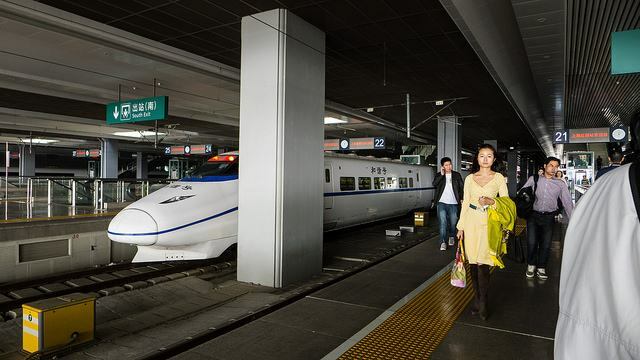 Additionally, China’s growing high-speed rail network is being connected to an ambitious city subway construction program, which currently accounts for over half the world’s tunnelling machines. This is starting to allow quick and easy access to the high-speed rail stations. Although the Chinese government now has $500 billion in rail debt, financed mostly by short-term bank loans, China’s new prime minister Li Keqiang has said that the nation will be continuing to invest $100 billion a year on its rail system. The 5,900-mile high-speed rail network is set to expand further.